Abstract. 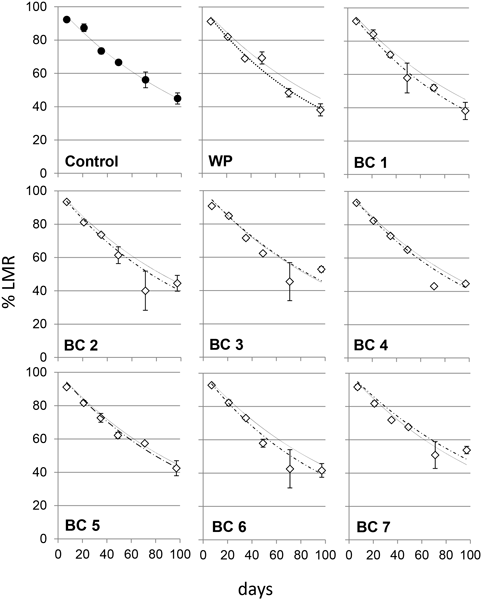 Impacts of biochar application at laboratory scales are routinely studied, but impacts of biochar application on decomposition of crop residues at field scales have not been widely addressed. The priming or hindrance of crop residue decomposition could have a cascading impact on soil processes, particularly those influencing nutrient availability. Our objectives were to evaluate biochar effects on field decomposition of crop residue, using plots that were amended with biochars made from different plant-based feedstocks and pyrolysis platforms in the fall of 2008. Litterbags containing wheat straw material were buried in July of 2011 below the soil surface in a continuous-corn cropped field in plots that had received one of seven different biochar amendments or a uncharred wood-pellet amendment 2.5 yr prior to start of this study. Litterbags were collected over the course of 14 weeks. 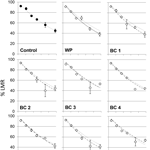 Microbial biomass was assessed in treatment plots the previous fall. Though first-order decomposition rate constants were positively correlated to microbial biomass, neither parameter was statistically affected by biochar or wood-pellet treatments. The findings indicated only a residual of potentially positive and negative initial impacts of biochars on residue decomposition, which fit in line with established feedstock and pyrolysis influences. Overall, these findings indicate that no significant alteration in the microbial dynamics of the soil decomposer communities occurred as a consequence of the application of plant-based biochars evaluated here. How to cite: Weyers, S. L. and Spokas, K. A.: Crop residue decomposition in Minnesota biochar-amended plots, Solid Earth, 5, 499-507, https://doi.org/10.5194/se-5-499-2014, 2014.